McDonald on X Case motion: "The time for playing cat and mouse is over"
Sinn Féin has said that management issues within the party will not distract it from seeking legislation on abortion. 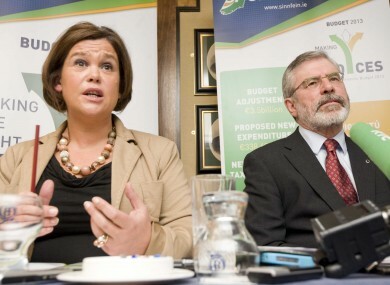 Mary Lou McDonald and Gerry Adams at the launch of their alternative budget this morning. SINN FÉIN HAS hit back at the controversy surrounding party TD Peadar Tóibín’s position regarding their party’s motion on X Case legislation. Speaking earlier today, leader Gerry Adams said that it was a distraction from the real issue. “The real issue is that as an Oireachtas, we need to protect women who are pregnant and also the medical people who are charged with taking taking care of them, and that’s what we’re focused on,” he said. Tóibín, who is pro-life, has not signed up to the party’s motion. The motion reflects a policy of this party that is 20 years old. Now, we do have an internal management issue and we’ll deal with this, but let me say this much, other political parties including the government would tell you that they too have management issues, internal issues in respect of this matter, and they use that as an excuse not to act. We’re not prepared to do that. Whatever the internal management issue is for Sinn Féin, please be very clear, Sinn Féin will, in a fair and balanced way, deal with that matter, and it is an internal matter. The time for playing cat and mouse on this issue and hiding behind the fact that certain people have, albeit sincerely felt doubts and difficulties, is over. Noting other parties who had the chance to legislate, she singled out Fianna Fail who, she said, now had “a lot to say on this matter.” “The reality is is that they equally failed to produce this legislation,” she said. I fail to see how they would do it by means of statutory instrument or secondary legislation, but if we had the report at all of our disposals well then we could consider the content of it. I think it has been the experience of people in this state, that bad opposition makes for bad government. We’re trying to be a good opposition. We’re not perfect, [we've] lots of faults, but in this case, we are acting, in this crisis situation that has been neglected by the Oireachtas for the last 20 years. Email “McDonald on X Case motion: "The time for playing cat and mouse is over"”. Feedback on “McDonald on X Case motion: "The time for playing cat and mouse is over"”.